With an arid setting at the foothills of the Atlas Mountains, Marrakesh is an exotic and friendly city. It combines history and tradition with modern culture and trends, to create a unique tourist destination for couples, families or friends. Although it lies in the desert, Marrakesh is anything but drab. It is boisterous and colourful, like a sparkling jewel in the middle of a haystack. The Majorelle Gardens are a surprising harmony of lush plants and fragrant flowers within the Marrakesh desert landscape. 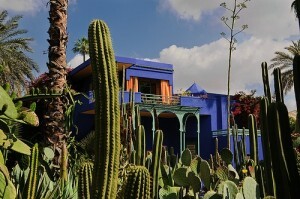 Designed by the French painter Jacques Majorelle (who was also a plant collector), the gardens house plants from five continents along with an art gallery and architectural marvels. Dramatic cobalt-blue walls are striking against the backdrop of green foliage and stunning water features. Stepping into this garden is like experiencing a kind of natural magic. 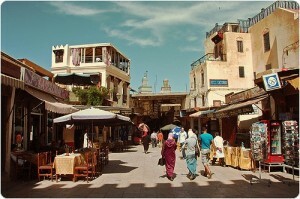 Marrakesh is well known for its souks. These bazaars filled with vendors selling handmade goods, decorative items, clothing, and other distinctive Moroccan items have a different ambiance depending on the day (or hour). Shoppers can find anything here, from fabric to potions, carpets to leather goods. Friendly and vibrant, the marketplace is a wonderful place to observe traditional Moroccan culture or to brush up on your negotiation skills. Bargaining is a custom here; you’re expected to haggle a bit to really get a deal. Depending on your point of view, you may find the souks to be mayhem, or you may consider them the heartbeat of an expressive city. 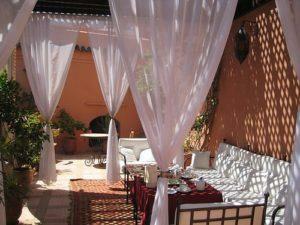 The riads in Marrakesh may be the most popular places to stay. These small guesthouses offer comfortable accommodations in inviting settings. Each riad has a central, open-air courtyard where guests can sit by a pool, enjoy the melody of a fountain, or inhale the scent of local flowers. Travellers on a budget will find riads charming and inexpensive, yet full of amenities and indulgence. Five times a day, visitors may hear the Muslim Call for Prayer resounding throughout Marrakesh. It can be heard over the din of the night market, and it may rouse you from your sleep in the early morning. The call reminds visitors to respect local customs and beliefs; many shops may be closed during prayer, and locals will stream toward the mosque when they hear the call. Tourists and locals will often be offered mint tea by shop or restaurant owners. This is a gesture of friendship and hospitality, and it is considered impolite to refuse it. The sweet, refreshing beverage, frequently referred to as Moroccan whiskey, is often served in ornate silver teapots and poured in a tall stream into delicate teacups or glasses. This custom allows people to sit back and rest amidst the commotion of the marketplace. 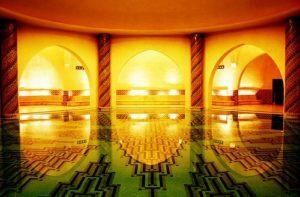 To wind down after a day of sightseeing, you can visit one of Marrakesh’s resplendent spas. The architecture and colours used in the décor alone evoke an exotic luxury. When combined with the spa services offered, they will really make you feel like royalty. Indulge in an aromatherapy soak filled with flower petals and orange peels, or let your worries melt away in a traditional Hammam (Turkish bath). Marrakesh is the capital of Southern Morocco and with its mixture of people, music, and culture, it’s just as action-packed and mysterious as you would expect; and even more chaotic. But it’s a good kind of chaos—the kind that keeps your eyes wide and curious and your other senses alive. Carolyn Patterson is the grandmother of three toddlers, a travel journalist and is a content contributor for Morocco Tours, a site dedicated to planning (and enjoying!) a trip to Morocco.